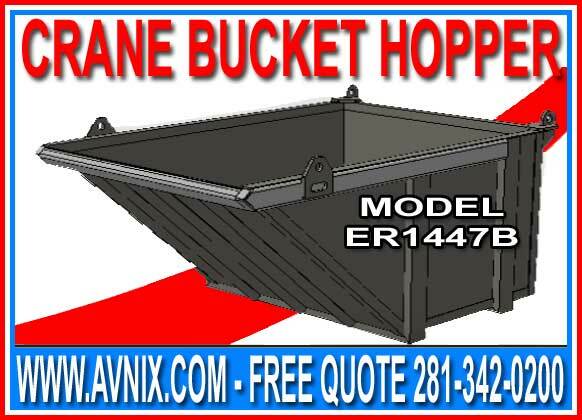 Home » Crane Bucket Hoppers For Sale Factory Direct Guarantees Lowest Price! Of all the commercial storage bins available, self dumping crane bucket hoppers are the most adaptable, resilient and simple to use. Our crane bucket hoppers come in several different sizes and are constructed of heavy steel and reinforced at all stress points to guarantee a long functional life. Avnix’s rugged heavy duty trash skip has large lifting eyes and has plenty of volume to handle most any kind of trash or bulk material. At any construction site building materials create large amounts of waste. For instance a electric saw produces small particles of waste in large quantities. When the trash skip is full, the crane operator can move and dump it to a trash receptacle for removal in a matter of minutes. Crane Bucket Hoppers are used for all kinds of materials handling situations including removing “tear-off” or other construction refuse from roofs and elevated decks. Our self dumping crane hoppers are not only affordable and flexible, they are must-have in any commercial construction or manufacturing setting. Avnix’s material handling products are reliable and made from the best the industry has to offer.